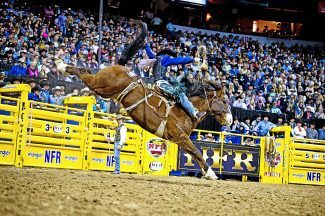 Wednesday Jan. 31 will showcase saddle bronc riders and saddle bronc horses starting with a Saddle Bronc Futurity at 1 p.m. in the Barnett Arena at the Rapid City, South Dakota Civic Center. Top stock contractors compete with two horse teams made up of the future super star colts of rodeo; five years in age or younger. Riders also are being scored, with the top three cowboys from the futurity earning a spot in the 7:30 pm PRCA sanctioned Xtreme Bronc Match, one of the PRCA's newest events! The PRCA Xtreme Bronc Match, will feature 30 PRCA bronc riders against 30 of the top PRCA bronc horses with a three man, sudden death short round to determine the champion. Current world champion, Ryder Wright, along with former WNFR competitors JJ Elshere, Jacobs Crawley, Cody Wright and Taos Muncy, will be competing for a $10,000 cash purse, prize money won counting toward the 2018 World Standings and a trip to the Wrangler National Finals Rodeo. 13 of the 15 WNFR 2017 contestants are entered in this star-studded event! Rodeo personnel will include 5X PRCA Announcer of the Year, Wayne Brooks and the most decorated Barrelman in PRCA history, Keith Isley, 22X Clown of the Year, Coors Man in the Can and Specialty Act of the Year. Along with special guest appearance from the Young Living Percheron Hitch. Grab your girlfriends and head out for a night of great food, deserts, and cocktails, runway fashion show, salon services, special event vendors, great prize drawings and more at the Girls in Spurs Ladies Night from 3:30-6:00 p.m.! Free Admission with PRCA Xtreme Bronc Match ticket or a purchased $20 Girls in Spurs Ticket. Event tickets sold at the Rodeo Zone Tradeshow. Tickets are available at http://www.gotmine.com; 1-800-GOT-MINE; At Rushmore Plaza Civic Center Box Office, Outdoor Rec at EAFB or Silverado in Deadwood, SD.